It's pretty hard to have grown up without seeing or reading some sort of iteration of the story of Cinderella. It's definitely an iconic part of our popular culture. The musical version written by Richard Rodgers and Oscar Hammerstein for television in 1957 starred the iconic Julie Andrews, would also find its subsequent remakes in 1965 with Lesley Ann Warren and in 1997 with R&B singer Brandy Norwood, along with countless productions on stage throughout the world. In 2013, the fairytale of Cinderella would get another modern day twist with its Broadway adaptation written by playwright screenwriter Douglas Carter Beane, known for writing the screenplay of To Wong Foo, Thanks For Everything! Julie Newmar. Recently, I was able to chat with Beane about how he got on board for Cinderella, how he went about his adaption, and even reminisced about To Wong Foo a little bit. What is it about the story of Cinderella that has made it so timeless and so many variations of it have been made? I think it is about the underdog story and I think people love the idea of transformation, people like the idea of changing, and everyone feels a little like their put upon. Everyone loves the moment when they walk into a room and everyone looks at them. I think that is a very moving moment in the show and every production. You always sort of wait for that moment where she shows up at the ball. How were you approached to do this modernization of Cinderella? I was asked to do it by Robyn Goodman, who's a producer. She said 'Is there a way we can do this that Cinderella doesn't just sit around, but she makes things again?' I said 'Let me look at it'. I watched the original 50s television version. It had its charms, but I was like this is really, in terms of any feminist thought, is really a real minefield. This is not a safe space. It happened that I went online and just found the original French version by Charles Perrault and was knocked out that so much good stuff was in the original story. For example, Cinderella made everything happen herself, she did it, and she had a sister who helped her. She met the prince several times and changed the way the whole palace was run. She got people to stop thinking about selfishness and ridicule and starting thinking about kindness and helping one another. This is really interesting and this would be a nice thing to be able to show your daughters and not be ashamed of, so I began to work on it. I called them up and said 'I think I got this!' I showed up with a script with a couple songs put in. We did a reading around a table. Everybody said this is really good, so off we went and from then, it became taking what I wrote and making it into a musical. How did you go about modernizing it? What parts really connect with what's going on today? Its interesting that it wasn't a modernized as much as I went back to the original version. After coming through the Victorian era and the 1950s, what they did to the story is you now look at it and the original version is much spikier. I think the kindness aspect at the end of the story says that "beauty is a wonderful thing to have in a woman but not as wonderful as kindness". I think there is this respect for treating other people with respect, people that are different from you, treating them with respect, which just seems to be in real need in the world right now, whether it be our idea of entertainment which is sort of reality shows where we gasp at people behaving rudely to one other. So there's that, politically what as become a climate of just absolute horrible things being said and applauded, as oppose to any type of this I'm going to think this out carefully before I say it. I think those aspects are needed in the world, so it suddenly became this quest, have two hours of your life where you see people try to work things out, and it's a silly, goofy, funny show, but hopefully it might say something along the way of how we treat each other politically and how we treat each other socially. It's so funny you brought that up because I'm here in London and I just had to Skype into Logo to the 20th anniversary screening of it. It's on Logo. I screened in and I talked to Michael Urie. I watched again after not having seen it for seven years and I fell in love with my work all over again (laughs). Isn't it crazy that it still has this sort of cult following after 20 years? What took me back is now somehow the drag part of it, which was so shocking and so crazy, has become so commonplace. We take for granted that people are going to actually see that's it again about feminism, its about optimism, its about race, oh my gosh! The opening scene has a black drag queen with blonde hair in a sequin gown of the Confederate flag named Rachel Tensions. I'm like 'That's crazy!' Even where we've come now, its even funnier! I forgot when RuPaul came down on the swing in the one scene, she's wearing a Confederate flag! Take it down! Take it down! (laughs) Especially moving is that I wrote it and a couple movies after that weren't wonderful experiences so I decided to stay doing theater and musical theater, and everyone once in a while I'll walk through New York or back home in Pennsylvania, I'll see somebody wearing a t-shirt that has a line from the movie in it. People steal a lot of those lines from movies and put them on t-shirts, and that's very exciting to me. 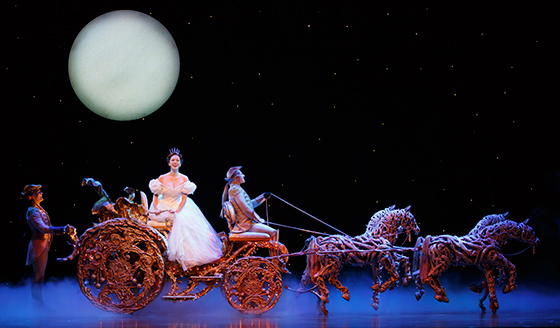 Rodgers & Hammerstein's Cinderella is set for a run at the Detroit Opera House in Detroit from February 16 - 28. For more information, visit broadwayindetroit.com.